Photo: Wallace State sophomore Olivia Royal (14) is obstructed by Southern Union shortstop Carly Alderman as Royal attempts a steal in the second game of their doubleheader on Tuesday night. 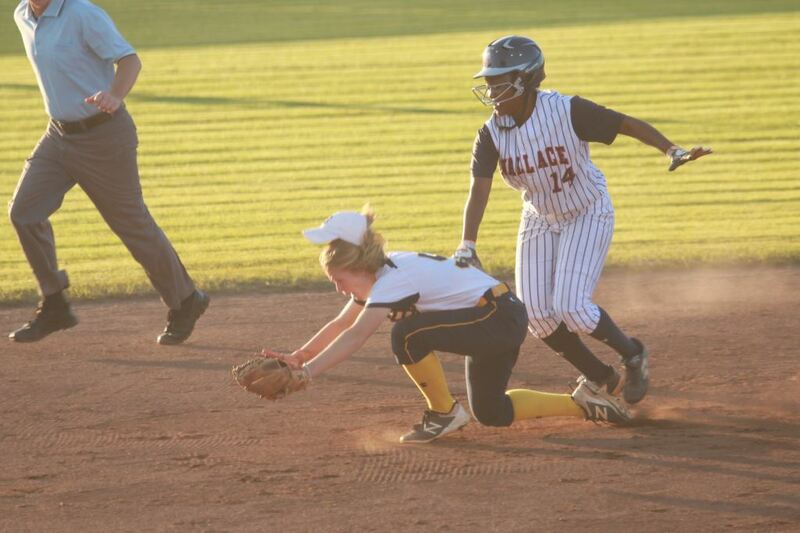 HANCEVILLE – Wallace State’s softball team swept Southern Union at Bobby McCracken Stadium on Tuesday night, winning 10-2 in five innings and 6-1, as the Lady Lions improved to 11-0 at home. As the calendar flips to the second go-around in league play, the Lady Lions, the nine-time Alabama Community College Conference (ACCC) champions, continue to stay atop the North Division standings with Shelton State. Wallace State (34-18, 15-1 ACCC) has won 28 of its last 31 games. Wallace State ended Tuesday’s opener in five innings, cruising to a 10-2 triumph. Freshman Taylor Beshears cranked her 10th homer of the season in the first inning to open the scoring for the Lady Lions. The freshman from Hewitt-Trussville leads the conference with 67 RBIs in 52 games. Wallace State scored a pair of runs in both the second and third innings for a 5-0 lead. The Lady Lions added another run in the fourth and closed it out with a four-run fifth. Molli Garcia finished 3 for 3 with three runs scored for Wallace State, Olivia Royal went 2 for 3 with an RBI and a run scored, Jennifer Gonzalez had a pair of singles and an RBI, Katie Parr had an RBI single and scored twice, Sarah Ellen Battles doubled and had a pair of RBIs and Karra Elam added an RBI. Jesse Butler (2-1) was the winning pitcher for Wallace State after relieving Brittany Ledbetter in the second inning. Butler allowed a run on four hits, striking out five. Ledbetter (17-5) frustrated the Southern Union bats in the nightcap, scattering a run on four hits. She struck out five and issued one walk. Royal had a pair of hits, including a double, and a stolen base for Wallace State, Beshears had an RBI triple, Parr doubled and scored, Leisha Yamauchi had a single and an RBI, Garcia added a sacrifice fly, Gonzalez finished with a single and scored a run and Elam singled and collected an RBI. Wallace State hosts Calhoun for a doubleheader on Thursday, beginning at 4 p.m.